In the past decade, Atomic Force Microscopy (AFM) and Optical Tweezers (OT) have revolutionised molecular science by measuring picoNewton forces over lengthscales from 1 to 104 Angstroms. In our laboratory, we have a Cell Robotics Optical Tweezer Apparatus which has been extensively modified for our experiments in polymer and colloids science. The apparatus consists of an optical trap which weakly "holds" a micron-sized bead. The trap is formed by a focused laser beam which is refracted through the transparent bead. The refracted rays differ in intensity over the volume of the colloidal bead and exert a force on the bead, drawing it towards the region of highest light intensity. The optical trap is harmonic near the focal point: the optical force acting on a colloidal particle position at x within a trap centered at x0 is Fopt=-k(x-x0), where k is the trapping constant which can be tuned by adjusting the laser power. In this way, the optical trap generated by the OT serves to both localise a colloidal particle and to measure the small, sub-picoNewton scale forces acting on the particle. With substantial modifications, our OT apparatus probes forces at small lengthscales and over small timescales which are necessary in studies in nonequilibrium statistical mechanics and polymer/biopolymer science. 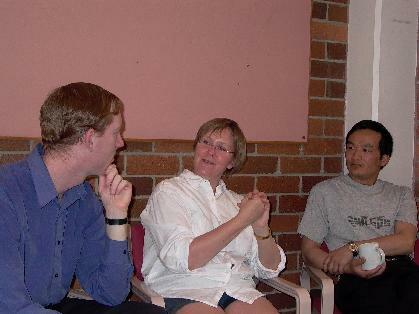 PhD student David Carberry, and Drs Edie Sevick and Genmiao Wang discuss research, cricket, cars, . . . at tea-time.